Your goals are our targets. It is with this thought that CARGOSOFT transports cargo with safety and absolute discretion. Founded in 2002 by partners with know-how in road transportation, the company provides its customers with solutions for dedicated transportation operations, prioritizing service excellence at a competitive cost. CARGOSOFT’s every-day goal is to exceed expectations of its clients, with differentials as high technology information, its own fleet and logistics intelligence in transportation operations, and engages with its partners to seek the highest level of service in the transport of cargo, aiming at the full compliance with what was planned. Vision To be one of the best transportation companies in Brazil, recognized by its excellence in the provision of logistics services through innovation, safety, competitiveness, and high level of service in its operations. Mission To provide logistic services in transportation, offering its customers safe and customized operations through fair remuneration which can provide satisfactory financial return to its shareholders. Cargo is the most valuable possession for CARGOSOFT. And that is why safety is primordial for its transportation. So, our fleet is entirely tracked. The vehicles have Autotrac, Sascar and Ominilink tracking systems with two or even three trackers on a single vehicle. All of them include safety devices of last generation, such as blockers and sensors, constantly renewed. More than transporting cargo, CARGOSOFT offers reliability and safety to its customers. In order to protect the integrity of the staff involved in the process and ensure the success of the operation logistics, the operational management seeks to switch the risk management systems used to increase work efficiency. 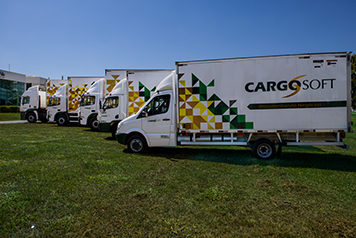 Operating with the most reputable risk management companies in the market, all of Cargosoft cargoes are monitored online, all the way from shipment to delivery to the final customer, no matter in which region of Brazil. CARGOSOFT has well-structured warehouses operating in cross-docking system, where the cargo is urgently separated and sent to its final customer. These warehouses are important points of support for the collaborative transport system of the clients who send and receive the cargo. For CARGOSOFT, every client is special and unique. The service and the operations performed daily by the company are part of a list of personalized services, even if involving products with similar purposes. There is no repeated formula for CARGOSOFT team. There are smart solutions based on excellence and processed for each client’s need and reality.